Using the new electronics board AS7010 this spectrometer has all the advantages of the current AvaSpec-ULS2048L-USB2 but offers USB3.0 communication as well, which means 10x higher speed compared to USB2. Unique is the second communication port which offers Gigabit Ethernet for integration in your company network and possibility for long distance communication at an affordable price. 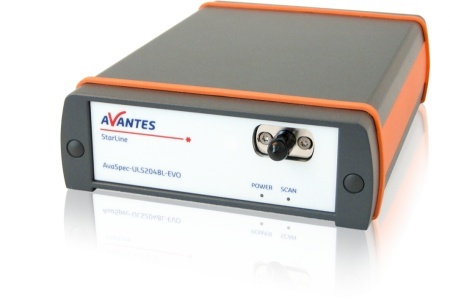 AvaSpec-ULS2048L-EVO Fiber-optic Spectrometer, 75 mm Ultra-Low Stray-light AvaBench, 2048 pixel CCD detector 14×200 µm, USB powered, high-speed USB 3.0 and ETH interface, incl. AvaSoft-Basic, USB cable.